As I am approaching my big 3-0 birthday, I am noticing some signs of aging. My metabolism is slowing a bit, I am finding a few grey hairs, and I am noticing little lines around my eyes. I know that aging is a natural part of life, but that doesn’t mean I can’t try to keep my skin looking youthful, for as long as possible. My daily skincare regimen consists of washing my face using the Oil Cleansing Method, exfoliating once a week, and applying a homemade facial mask once a week. I use olive oil or coconut oil as a moisturizer, due to my habitually dry skin. One thing that I have been a bit negligent on is using a homemade eye cream. So I figured it was time to turn a new leaf, and make a homemade eye cream to help lighten up, tighten and rejuvenate the skin around my eyes. Bring 2″ of water in a small saucepan to a boil. Add coconut oil, vitamin e oil and primrose oil to a clean mason jar. Place mason jar in water (effectively creating a double broiler method) and warm until the oils are melted. Remove from heat and add in essential oils of choice. Pour into small, clean container to store. The oil will stay at a liquid state until it has cooled below 76 degrees, but you can speed along the process by placing it in the refrigerator. 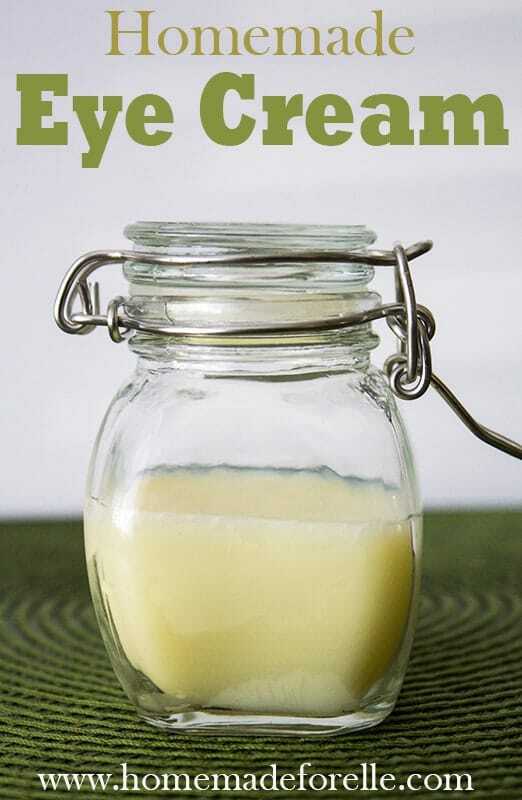 Apply around the eye in the evenings, being careful to avoid getting the homemade eye cream into the eye. *I recommend frankincense, lavender, lemon or ylang ylang essential oils. Note that the main ingredient is coconut oil, and if you have ever used coconut oil, you know it has a relatively low melting temperature. If you live a warm climate, you can keep your homemade eye cream in the refrigerator to keep it solid. Otherwise, refrigeration is not necessary. Coconut oil is all natural, and provides rich moisture to the skin, and has been rumored to strengthen underlying tissue. Vitamin E oil is packed with antioxidants that helps to protect and repair skin (source). Those same antioxidants help neutralize free radicals that can damage your skin, cause fine lines and dryness. (source) Primrose oil has long been known for its anti-aging qualities. Before using essential oils, make sure you understand proper handling of each, and note that most essential oils should not be used on skin undiluted.